"Worst web check in system"
Not Verified | Pune to Bangalore. Worst web check in system. Tried to web check in but payment was not successful on repetitive attempts. Since payment was not successful and no confirmation on check in. Hence rushed to airport. Reached two hours before flight schedule to counter. Person on counter surprised me asking INR 200 for web check in. I said when it was not done, then why should pay. She was adament or I would say Robot and insisted for payment , else leave the counter without boarding pass. Very frustrating situation. ✅ Trip Verified | Kolkata to New Delhi. My friend booked this airline for me and turned out to be a real loss as they mishandled my baggage. Their customer care executive guided me to write an email along with pics attached instead of contacting their airport staff. After doing so their employees straightaway denied to take any action by replying back that I should have contacted their ground staff. What the heck! Even though I told them that their staff didn't guide me well, still no action is taken. I would recommend to go for Vistara or Air India instead of cheap airline like GoAir. They don't really accept their mistakes (even when enough proof is given) may be because they do realise that the mishandled baggage of customer is far more expensive than their domestic round trip. And yeah, the people responding to emails can't really understand what are you trying to say. "I had just few extra kg"
✅ Trip Verified | Jaipur to Mumbai. Worst experience. Airline who just try to make money out of their passengers. I had just few extra kg in handbag and they made fuss about it and charged from me. Such airlines don’t leave any opportunity to make money. 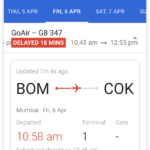 Not Verified | New Delhi to Mumbai with GoAir. The flight staff were very cooperative and supportive. 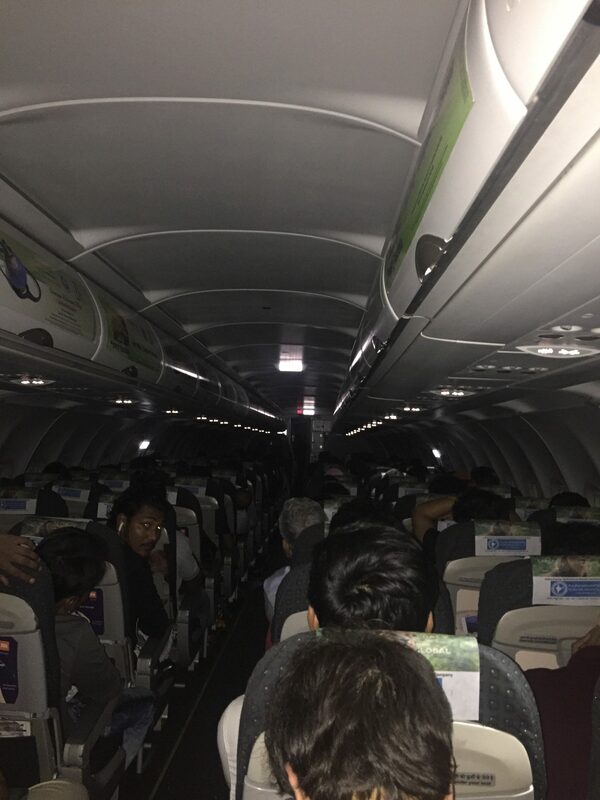 The flight was delayed for 15-20mins due to heavy traffic at Mumbai airport at landing. The airline departed on time. ✅ Trip Verified | Male to Mumbai. Day before journey we got a message that our flight is delayed by 30 minutes but on the day of journey it got preponed without informing us. Keeping the delay in mind we planned our journey and reached inside the airport at 4.10pm till that time check in counter was working but seeing us a group of 27 people they shut the check in counter due to which we missed our flight. 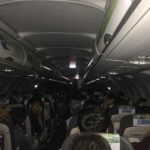 Go Air is the first mismanaged airlines I have ever seen, keeping their staff convenience at priority and ignoring the passengers convenience. ✅ Trip Verified | Ranchi to New Delhi. I don't recommend this flight for international travel beyond Delhi. They do not allow any extra (a few kgs) luggage weight if you have international travel. Better to travel with Vistara or Air India. They also don't accept international debit or credit cards which other airlines accept. I had to get extra cash from an atm and pay additional charges. 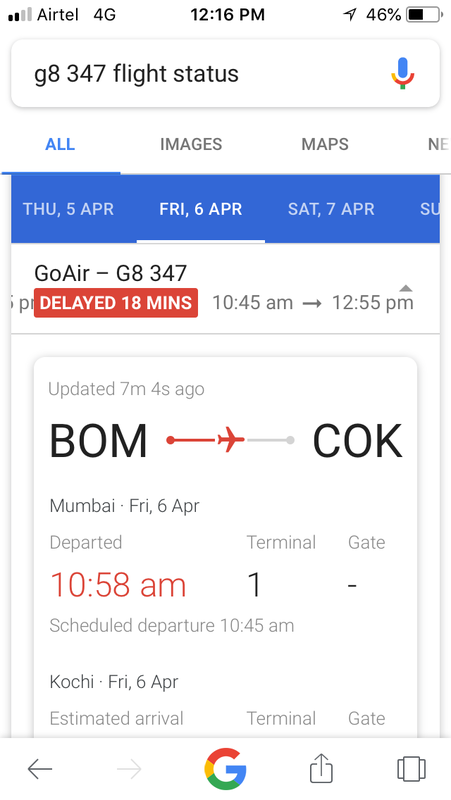 "flight is delayed by more than an hour"
✅ Trip Verified | Flew Bangalore to Patna with GoAir. Worst experience. I bought the ticket 2 days earlier at a high price just to arrive on time. But now I am at Bangalore Airport and the flight is delayed by more than an hour. From now on I will never go for GoAir, worst flight. ✅ Trip Verified | I was traveling to Ahmedabad from Hyderabad in morning fight. At luggage counter the guy welcomed me very nicely and he was very supportive and helpful. I was sick but gesture for his welcome made my morning cheerful. Thank you GoAir. "they told that counter is closed"
✅ Trip Verified | Mumbai to Kochi. I reached airline counter 70 mins prior to my boarding time. I was waiting in queue for more than 20 minutes. Only one chec kin counter was open. They didn't even announce the final call or something. I reached the counter before 50 min of boarding and they told that counter is closed for that particular flight and its rule that 45 min prior the counter gets closed. One airline person was ready to do something by listening to my situation, but his seniors denied. I requested and finally they give me free ticket for next day. Really disappointed!! I agree that tickets are cheap comparatively, but this kind of situations are really unappreciative. "keep the seat belt sign on"
✅ Trip Verified | Mumbai to Patna. The buttons above the passenger seat to call assistance were kept disabled for most of the time. The airline has use an innovative method to keep the seat belt sign on for most of the time, so that passengers do not use the toilet facility until it’s extreme emergency.